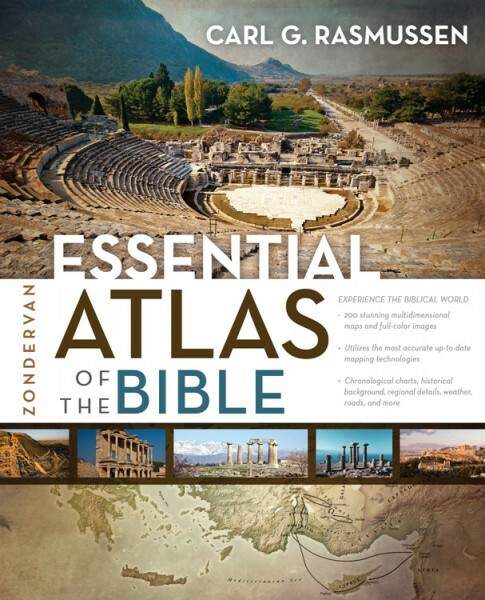 The Zondervan Essential Atlas of the Bible by Carl G. Rasmussen is a concise, full-color atlas filled with stunning multidimensional and three-dimensional maps, photos, and charts designed to help you better understand the history and places of the Bible and its world. Discover everything you need to know about the lands where Jesus walked, Moses traveled, and Paul preached. Packed with multidimensional maps, photos, and charts, the Zondervan Essential Atlas of the Bible is designed to help you better understand the history and places of the Bible and its world. This full-color atlas is concise but thorough, perfect for Bible students, travelers to the Holy Land, or any reader of the Bible curious to find out more about commonly mentioned places in the Old and New Testaments. With this easy-to-understand atlas, you’ll find Bible study more engaging and comprehensible, and you’ll learn the essential facts about the fascinating lands of the Bible.